A design partner introduced me to his client, Lauren Condell at Front Forty Foods. Lauren, a personal chef and fitness trainer, secured funding to launch Front Forty as a food/tech startup in Denver, CO. Lauren believes the purest pleasure is a well-made meal, and she's envisioned a way to bring slow, field-to-fork food into our lives quickly, at the touch of a button. Front Forty's chefs makes the most nourishing, craveworthy grab & go superfood in Denver. 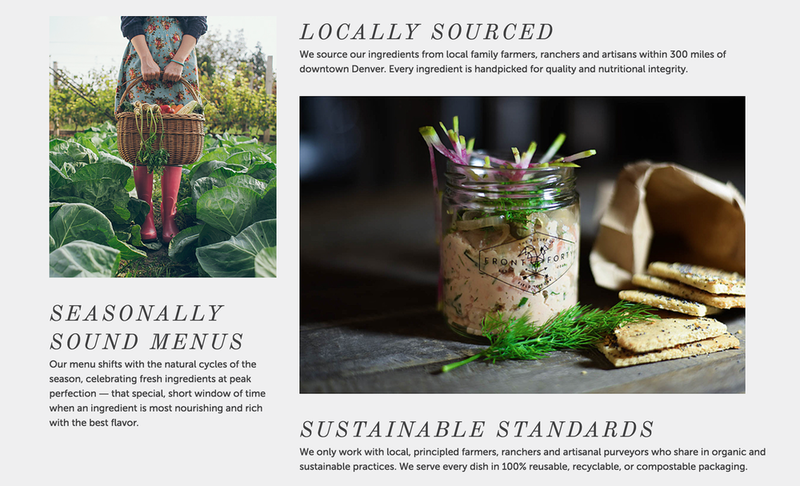 They source only pure, local, and seasonally sound ingredients from their community of sustainable family farmers, ranchers, and artisanal purveyors within 300 miles of downtown Denver. Every morning before the sun comes up, they prepare fresh, farm to table sweets and savories for folks with specialty diets, then hand-deliver preorders and a la carte meals to their futuristic, automated kiosks in the city. Pssst. Click on the rooster to watch the brand video.